Quite a few college students and young adults from the Netherlands have been attracted by the opportunities that Detroit presents. I believe that many Dutch and German college students often spend summer months at the Yes Farm on Farnsworth or other similar endeavors in the Motor City. Three twenty-three-year-old architectural students, Ronen Dan, Bob Hendrickx and Domink Lukkes, graduated from the Technological University of Delft in 2016. They sought to rebuild an older home so that it would be as energy efficient and as green as possible. Apparently they sought to secure an older home worthy of renovation in the Netherlands, but then realized that it would take a fortune to buy a residence there, a fortune they did not have. Then they appreciated that they could, for one thousand dollars, purchase a suitable, repairable home for their innovative endeavors in Detroit. They found the one shown above on Detroit’s Ford Street and purchased it from the Detroit Land Bank Authority for $1,000. They wished to remodel it so that it would serve as a model for other homes in the area. In doing so, they will illustrate techniques and strategies that will allow others in the neighborhood to retrofit their homes so as to greatly reduce their utility costs and pollution. I do not know if they plan to have anyone live in the home. I believe they are creating spaces within the home where they can illustrate strategies to make the older, and often dilapidated, homes in this neighborhood, much greener. They have, apparently, recruited a local resident to serve as manager of their project. Presumably, there will be a staff to assist home owners and renters. The renovated home will also serve as a model and illustrate what may be done to reduce pollution and improve energy efficiency. 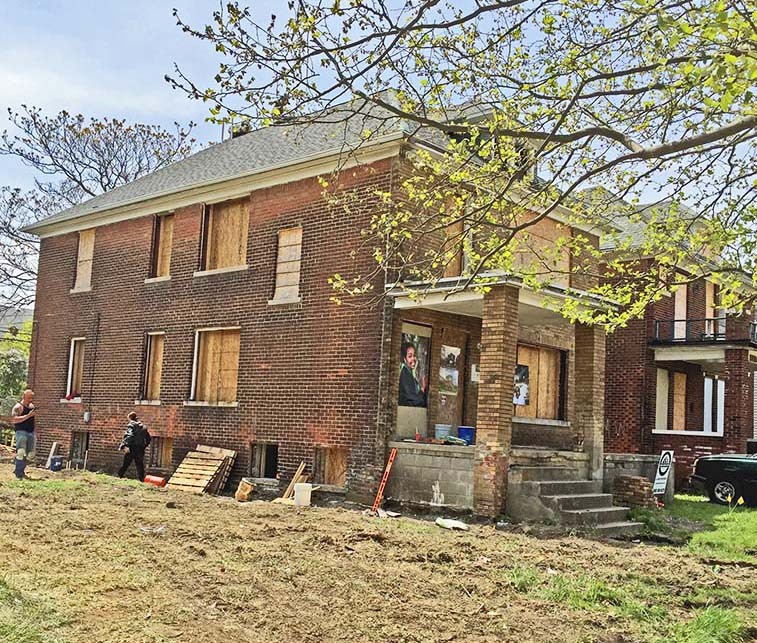 The basement of the home will be converted into a center where students from the Detroit Public School across Ford Street, the New Paradigm Glazer Academy, may come to learn about ecological issues and sound construction strategies. The Greening of Detroit organization will assist in the planting of gardens and trees so that local residents can grow some of their foods. This home has a large side lot suitable for gardening but I do not know if it is included in this project. This home had been vacant since 2008. Of course, it takes money to accomplish this. I believe the young architects began with a crowd funding campaign and then found foundation support for their endeavor from the local Rotary Club, a local real estate broker and from others By May of 2017, they had raised more than $100,000. They estimated that $230,000 will be required to reconstruct this residence as a model green home. Considerable attention was paid to this project in the Netherlands and a group of Dutch students will, apparently, spend the summer of 2017 rebuilding the home. There also may be support from Dutch sources. The home is located within the Hope Village area. This is an array of 100 city blocks that surrounded the Focus Hope campus on Oakman Boulevard. Focus Hope has announced plans to provide an array of social and educational services to residents of this area. In addition, they intend to restore many or most home by 2031.